Our habit when traveling is to pick up every piece of travel literature we touch, then sort it out back at the Cougar. 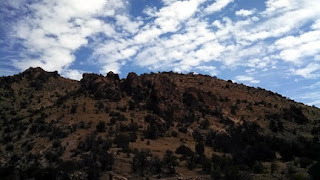 Early in our time at Chloride, I grabbed the booklet Day Trips Along the Geronimo Trail – A Guide to the Scenic Byways of Sierra County, New Mexico. Filled with pictures and historic documentation, it triggered our desire to explore the area. 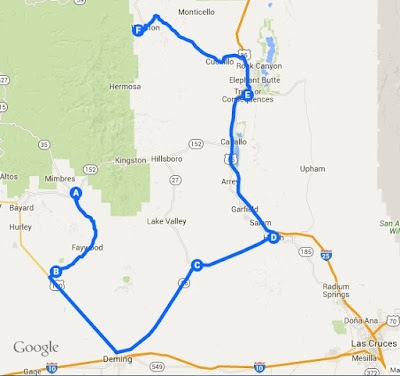 So we used it as a planning tool for the sightseeing adventure we took today. 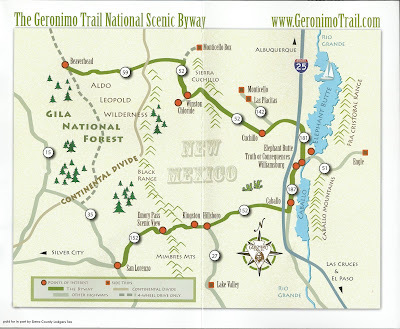 As you can see on the map, The Geronimo Trail National Scenic Byway runs from Beaverhead in the northwest to San Lorenzo in the southwest and includes (almost) our location in Chloride. While we didn't get on the heavy green line, Chloride did get prominent coverage in the booklet. 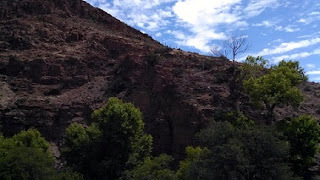 For today, we chose to do the southern leg of the trail. 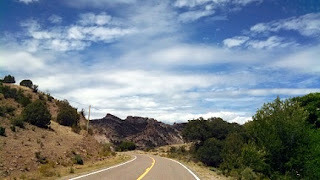 So we started at Exit 63 of I-25 where we picked up Hwy 152 west. 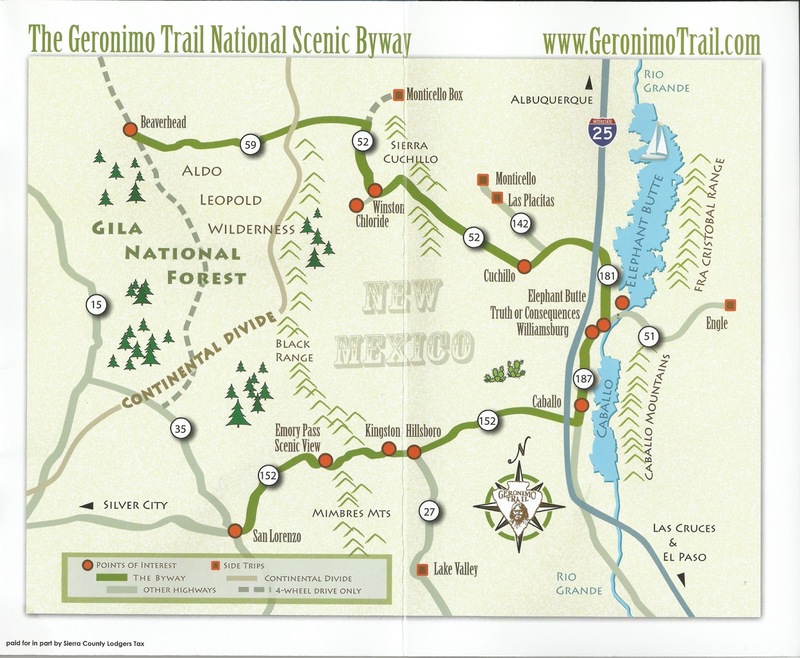 Hillsboro was the first town along this leg of The Geronimo Trail National Scenic Byway. Hillsboro dates back to 1877 when gold was discovered in nearby mountains along Percha Creek. The town had its ups and downs and is now a small community of artists, ranchers, and retirees. 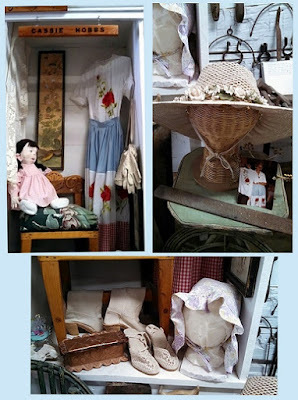 "Main Street has a variety of shops, art galleries, and restaurants" says the tourism literature. Maybe so but today everything except one café was closed. We stopped there for a muffin and a cup of coffee. A number of our visitors at Chloride say they are from Hillsboro. I guess I expected a little more. A small sign and an unimpressive turn off highway 152 put us in Kingston. By quickly applying the brakes, we managed to stop before running through the whole town. The history of this region of New Mexico is all related to mining. Kingston is no exception. 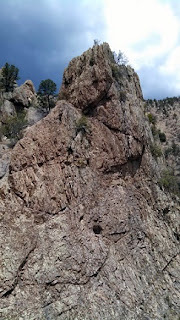 It was founded in 1882 as the result of a rich gold strike. 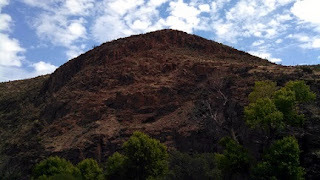 Dubbed "one of the west's wildest mining camps", in it's heyday, it boasted 7,000 people, 22 saloons, 14 stores, three newspapers, numerous hotels and boarding houses, and an Opera House. 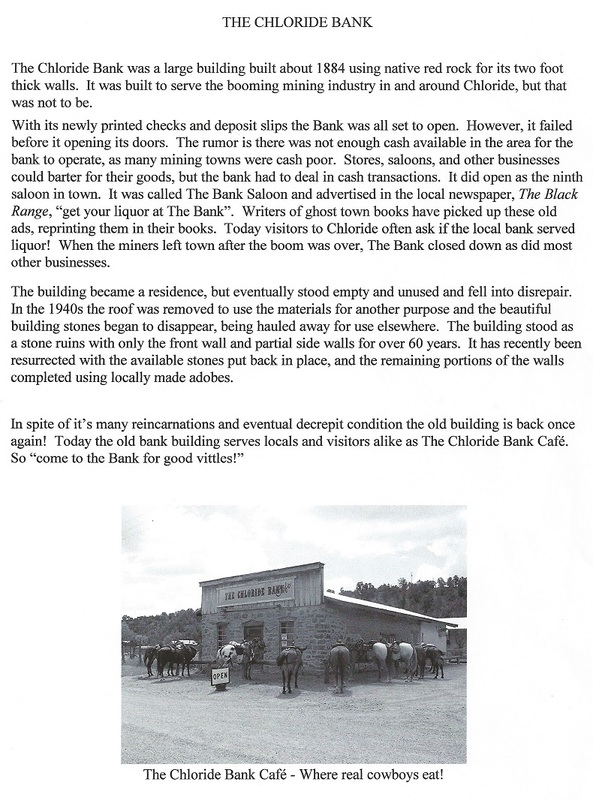 Today the Percha Bank Building is the only fully intact original structure in town. It houses the Percha Bank Museum (open by appointment). 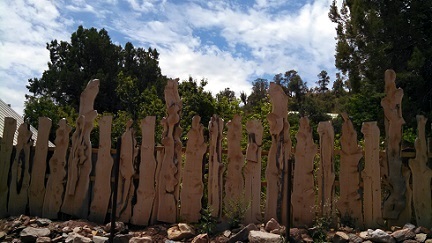 I did get this picture of an interesting fence. Someone must have had a tree that could not be made into anything else and a sawmill that needed some exercise. 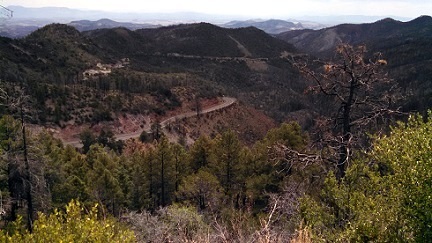 While Hillsboro and Kingston were disappointing, the spectacular views in the Gila National Forest were not – especially these two shots in Emory Pass. I'm reminded of the futility of trying to take a picture of the Grand Canyon. A camera cannot capture the scope of the scene. So it is here. Maybe the picture will give a hint. 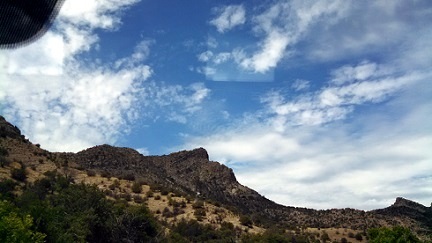 Here are a few more pictures of the mountains along Hwy 152. 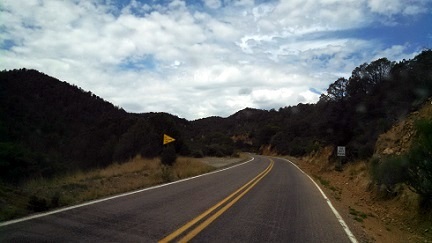 Winding our way down out of the Black Range mountains, we reached San Lorenzo. 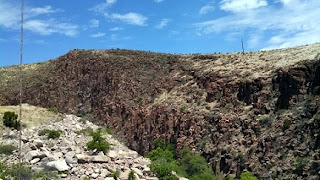 Compared to what we had just seen, San Lorenzo (GPS: 32.810000, -107.920000) is a fairly large town. 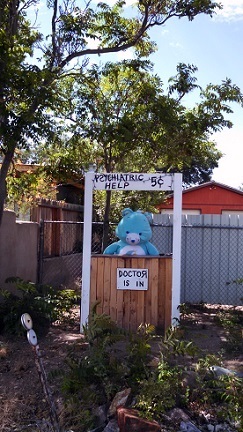 Its population was 97 as of the 2010 census. Our odometer told us that we had covered 120 miles – most of that on a winding mountain road. 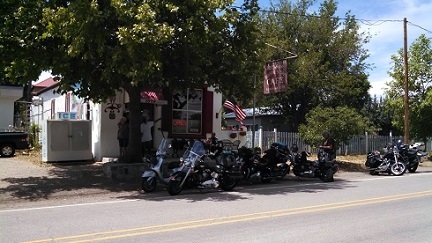 We stopped at a gas station café for a much needed pit stop, gas, and lunch. Mexican food of course. Going home by retracing our route was not inviting. 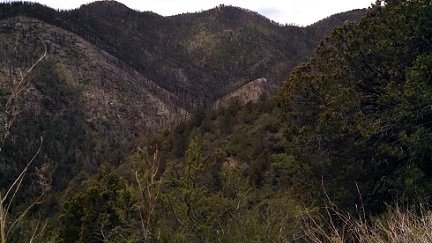 Although beautiful, it was fatiguing, and we did not care to repeat it. The gas station manager laid out a route that would take us back without having to go over the mountains. It was longer but flat. We opted for that. 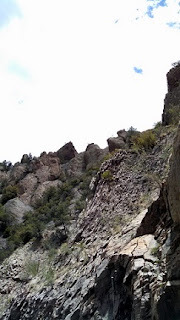 This leg of the trip turned out to be 167 miles, longer than 120 to be sure, but it was OK. We got to see some more of New Mexico and we got home very tired. I must say, however, the person who wrote the description in the guide book has a bright future writing real estate ads. N 33o 20' 19.17", W 107o 40' 52.67"
The Monte Cristo Saloon and Dance hall is a large adobe building with a ‘false front’, fronting on Wall Street. It was built in 1880 by Mr. Austin Crawford, and was probably the first of the nine saloons that eventually lined Wall Street. 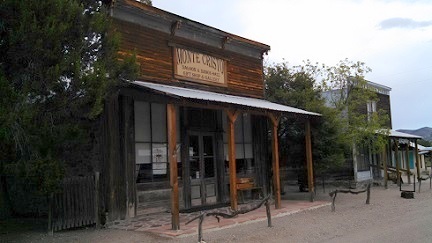 In 1884, the city fathers realized they needed a school for the approximately 42 children in town, so they leased the Monte Cristo Saloon building for the school. Some of the rooms were used as living quarters for the school teacher, and for at least one of the original families. 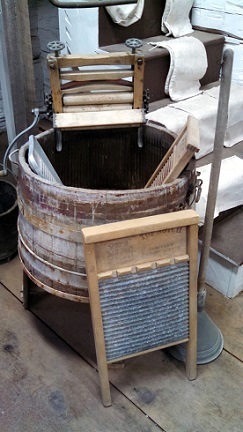 Eventually a real school building was built, and the Monte Cristo building became a repository for mining equipment. At the rear of the building in what may well be an addition, is an Assay Furnace. It is a large structure made of brick, but with a very small fire box. 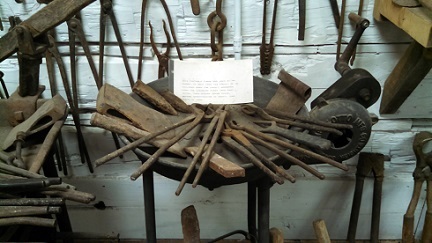 The assay furnace was used to test the ore samples brought in by local prospectors to determine the value. It was also used to determine the value of the ore on the ore wagons heading down from the stamp mill to the smelter east of Chloride. 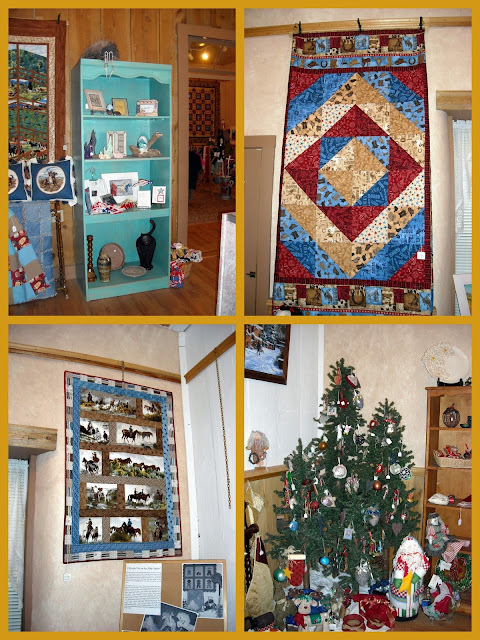 The Monte Cristo Saloon and Dance Hall has been completely refurbished, and is now the home of the Monte Cristo Gift Shop and Gallery. The Gallery is operated as a Co-op, and has over 30 local artists displaying their creations. 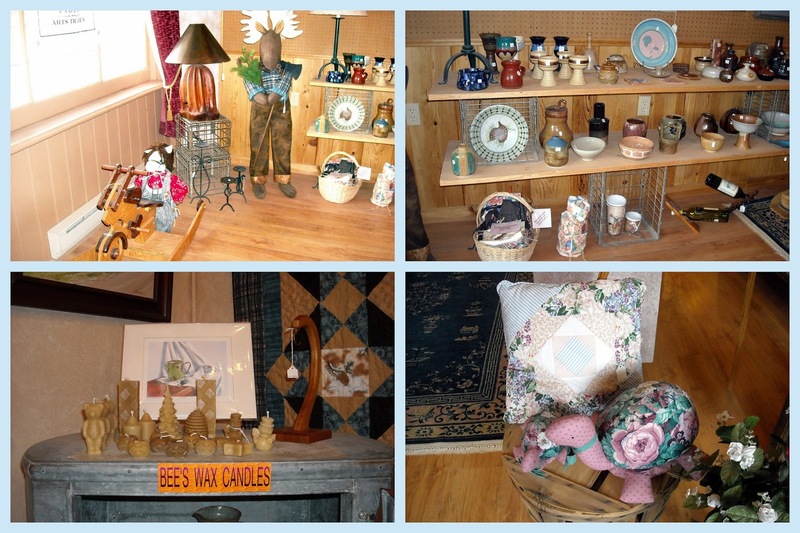 The items include wood carvings, photography, hand painted glass ware, fiber arts of all kinds, and collections of locally produced paintings. Thanks to Don Edmund and Linda Turner for this historical account. 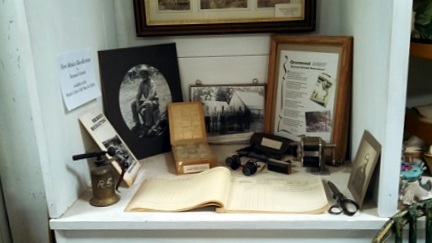 The history of the Pioneer Store Museum as recorded and told by Don Edmund. 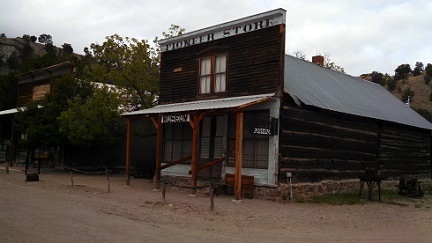 The Pioneer Store is a large building made of Ponderosa Pine logs. It was built in 1880 by Mr. James Dalglish, who came from eastern Canada. 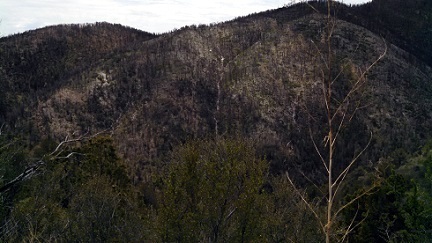 The logs had to have been harvested from the Chloride canyon, and the closest timber is located approximately 8 miles up the canyon. Not only are the logs huge and had to be handled by manpower, but the Indians were determined to drive the new arrivals out, making the log harvest a dangerous endeavor. The store was completed in 1880 in spite of the Indian resistance. Records indicate that the new store was attacked by Apaches in 1882. Mr. Dalglish stocked everything the miners and their families needed. 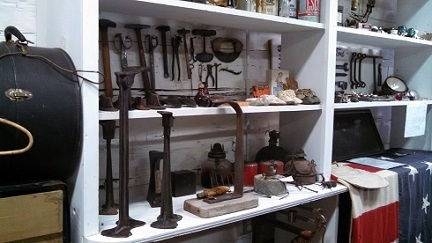 The merchandise included mining tools and equipment, ranch supplies, clothes for the entire family, and all manner of food stuffs. 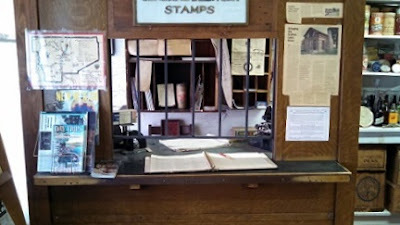 The store had a large safe, and the records indicate that the store functioned as both a bank and a pawn shop. 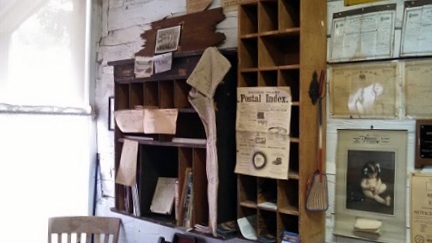 The Postal Service installed a Post Office in the front of the Pioneer Store in 1881, with Mr. Dalglish as Post Master. The mail boxes and front counter are still intact. The Black Range newspaper was established in 1882 in the upper rooms of the building. The paper was a weekly, and was published until the late 1890s. 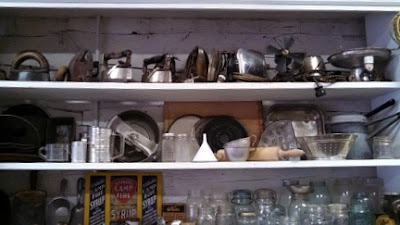 The Pioneer Store was operated by Mr. Dalglish throughout the Silver Boom years from 1880 through 1897. 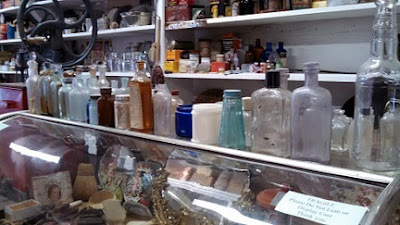 When the town began to die, Dalglish leased the store out for several years, and in 1908 sold it to the U.S. Treasury Mining Company. 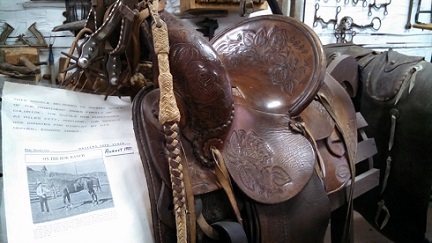 That company was then owned by the James Family, and they used the store as a commissary for their ranch and timber workers. 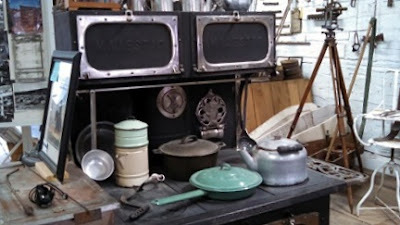 In 1923 they closed the building and sealed all the windows and doors with roofing tin and lumber with all of the furnishings, and merchandise still inside. 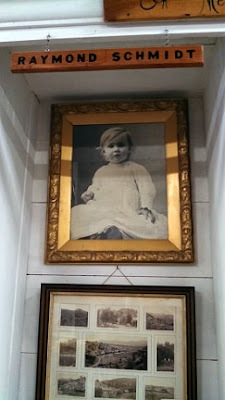 It has been reported that the James family intended to save the building and its merchandise intact so that their son would have a business ready for him when he completed his education back east. The son, Edward James Jr. was educated as a scientist and he married a woman from Brooklyn, New York. Mr. James career kept him from living in Chloride, however, he returned frequently to visit relatives and to hunt with his friends. How we were able to meet Mr. James and eventually purchase the Pioneer Store is a fun story. 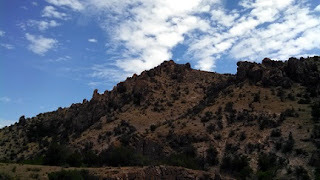 Dona and I were living in Las Cruces, but spending every weekend in Chloride working on the old derelict house we had purchased during our first visit on Labor Day Weekend in 1977. On one weekend in the summer of 1978 while working on our place, we noticed a man and a woman walking up the street toward our place. We went out to meet them, and Mr. James introduced himself and his wife. They had come from Livermore, California, to visit a relative in Chloride. He asked Dona and I if we were interested in looking into the old store building with him. Were we!! Mr. James and I removed the roofing tin and the lumber that was blocking the back door, and not having a key, he asked me to remove the bottom panels of the wooden door. We then crawled into the building. I cannot describe the sight we saw. 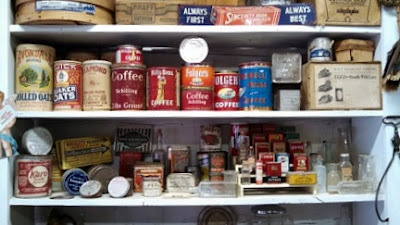 All of the furnishings and merchandise was just as it was when they closed the building in 1923, except that everything was covered with Bat guano. It was about 2 inches deep on everything. There were literally thousands of Bats in the building. Many were flying about as we had disturbed them, but many more still clung in clusters on every exposed ceiling joist. I said “Mr. James, sell us this building and we will make it into a museum”. In the summer of 1988, ten years after we first met Mr. James, he announced “I will sell you the store building and all of its contents, and the old Monte Cristo Saloon building next door". 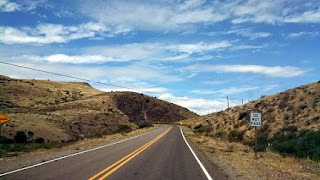 It was another 3 years before we finished the projects we had already started and could start work on the Pioneer Store. The task of restoring and refurbishing the building and the contents was enormous. First of all, the rodents had to be evicted. The Bats were not a problem. Once we removed the tin and boards from the windows and doors and let some daylight in, the Bats left. Using traps and the neighbor’s cats, we eventually got rid of the rats. When the building was closed in 1923, the town folks has gathered up what there was of the town records from 1880 to 1923, and stored them in boxes stacked near the front of the building. Over the years, the boxes weakened and tipped over scattering documents the full length of the center aisle. Those had to be picked up first. We found that the Bat guano could be brushed off and the papers could be saved, but where the rats had nested, the papers were so soiled that they had to be thrown away. We wound up with around 35 boxes of old town records. 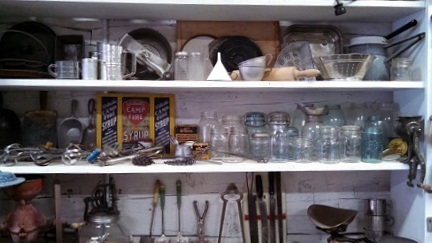 Next, we took many pictures of the inside shelves and storage bins. 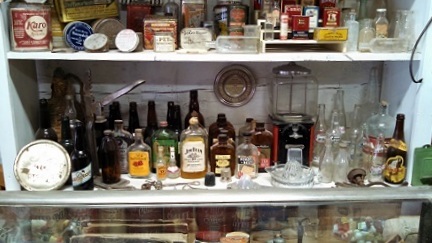 The intent was to be able to replace the items in their proper places after they had been cleaned. 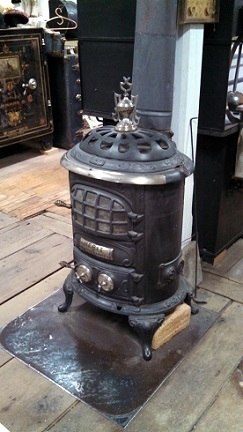 Once all the items had been removed, we began the restoration and refurbishing tasks. All of the shelving and all of the counters and bins were removed so the interior could be cleaned. Nearly all of the glass in the large front windows had been broken (some of them by BBs), and the building had acquired a decided lean to the right. Once the logs were pushed back into shape, we were able to rebuild the window frames, then install new glass. The walls had been whitewashed originally, but we decided to use a cheap grade of white paint, and give it one thin coat. The objective was to let the stains on the walls come through the paint. They did. Once the floor was cleaned, we found several black stains at various places. Mr. James happened to visit, and we asked if he knew what caused the stains. He reminded us that the Black Range newspaper had been printed up stairs, and it was his opinion that ink pots spilled upstairs had seeped through cracks to the down stairs. When we checked the black stains upstairs, they correlated with those downstairs, so we did not attempt to remove the stains. With the building straightened up, cleaned, painted, windows replaced, and items of merchandise cleaned and refurbished, we were ready to put the items back in place. This was the fun part. As the items went back on the shelves we began to realize what a treasure this truly was, a real ‘old time Mercantile’ right here in Chloride. 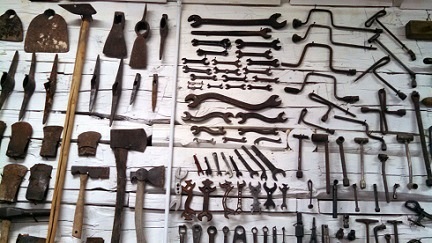 When we began putting the tools back on the shelves, we realized it would be difficult to see them, so we decided to leave the rear shelving out, and instead hang the tools on the walls so they could be seen easily. 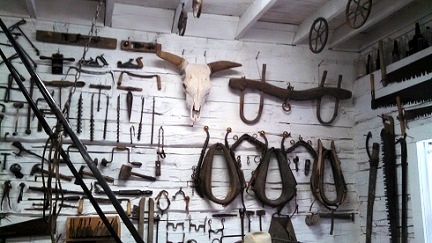 In 1997 the pioneer store was finally ready to open to the public as the Pioneer Store Museum. Your visit includes a guided tour through history by the owners: Don Edmund, Dona Edmund, or Linda Turner.